If you are road tripping somewhere east this weekend, chances are that you will have to drive through Las Vegas. This isn’t bad if you plan on stopping in Vegas for a round of poker and a crazy night at a club. However, if Vegas isn’t one of your destination and you are forced to drive through it. You should be terrified of the traffic. 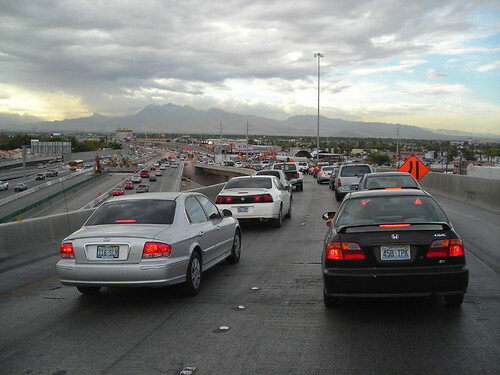 Traffic in and out of Vegas is no jokes particularly during rush hours and holidays. Vegas is probably the most popular getaways for Los Angeles residents. We’re talking about A LOT of people who go to Vegas every weekend. I have only stopped in Vegas for one night my entire life. However, I am the victim of that horrible traffic every time I drive through it a few times on my road trip to Utah. But here are a few tips that you should keep in mind when driving through this city of light. Sunday is when most people leave Las Vegas to come back to Southern California. If there are anyways that you can avoid Sunday, DO IT. Driving west of Vegas on Sunday can turn your 4 hours trip back to LA into a 7 or 8 hours plus horror. Believe it or not, Las Vegas area is surprising outdoor friendly. There are numerous hiking trails and campgrounds nearby. There are two great desert parks nearby Las Vegas, which are the Valley of Fire (30 minutes east from the city) and the Mojave National Preserve (2 hours west). If you are road tripping somewhere far away like Zion National Park, Mojave National Preserve isn’t a bad midway point stop if you’re commuting from Southern California. By camping somewhere nearby, you don’t have to drive through Vegas during traffic and you can wake up early the next day to continue your journey. If you must drive through Las Vegas on a Sunday, anytime before 10am is much better than anytime after. Think this, people went out the night before. They probably won’t leave the city anytime before 10am due to hangover. So if you can get far and away from Las Vegas before 10am, you should be able to avoid the horrible traffic. Afternoon and evening are the worst time to leave or enter the city. I know that it’s very tempting to stop in Las Vegas to grab a bite. 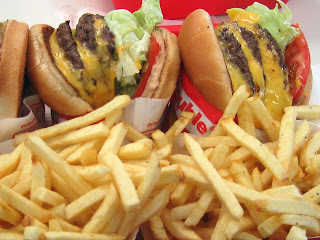 If you can hold for an hour longer, you can save yourself sometimes by stopping in Barstow to eat instead. There are numerous choices. Eating in Vegas can be a bit out of the way especially if there’s traffic. Don’t deal with getting off the freeway during traffic just for in-n-out in Vegas, the one in Barstow is easily accessed and is much less crowded. I’ve been there during dinner time at 6pm, and it has the be the largest In-N-Out i’ve ever been to and yet, it was pretty empty. However, beside all of this. Make sure that you have a good playlist. That’s vital to surviving a long drive. Unless you drive like a crazy person, I think Valley of Fire is closer to an hour than it is to half an hour north of Las Vegas, though it’s been a while since I made the drive. Also, plenty of nice hikes within that one-hour radius, too. I’ve got about a half-dozen of them written up so far in my hiking blog for this year, so in case you actually do end up spending time in Las Vegas and want to do some hiking, you’ve got some ideas. Some of them are NOT summer hikes, however, so obviously take the weather seriously.